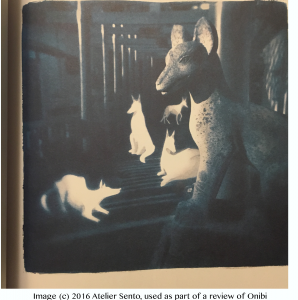 Onibi: Diary of a Yokai Ghost Hunter by Atelier Sento (aka Cécile Brun and Olivier Pichard). Translated from French by Marie S. Velde. Tuttle, 2018. 9784805314968. 128pp. In a small shop in Suruwada, a young French tourist (Cécile) buys a magical camera with a lens polished by monks. Cécile and her boyfriend Olivier are told it can photograph supernatural creatures, or Yokai. As they explore the area and its stories, Cécile snaps a photo which is printed in blue at the end of each story (see below). The tales of the yokai are true, and invisible creatures are everywhere (including foxes and the worm-like bura bura along with more familiar types of ghosts). 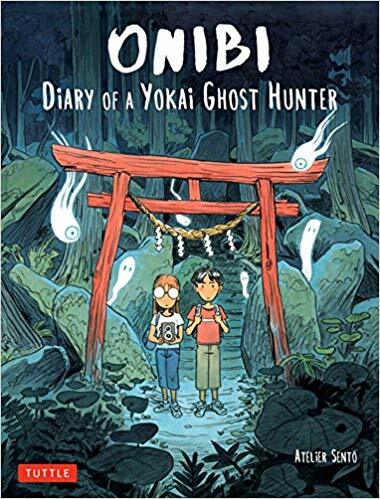 Brun and Pichard were inspired to write this graphic novel on their trips to Niigata Prefecture and the folks they met there. Their love the people, the place, and in particular the food comes through. The creative team’s pencils and watercolors give great expressiveness to faces, colors, and light, and make every page a pleasure to read and reread.